In 19th century China, a small jungle village has become a battleground. Under pain of death, the village blacksmith (Rza) has been supplying weapons to the various warring parties. He asks no questions and takes no sides in any conflict, preferring instead to silently stash away his earnings. Eventually, circumstances force him choose sides, at which point he uses his skills to become a living weapon. 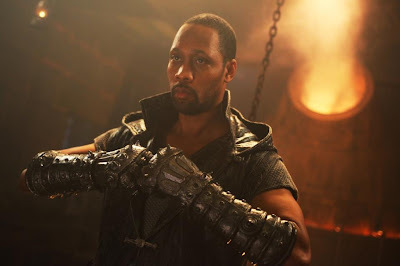 The Man with the Iron Fists is Rza’s highly touted passion project, written in collaboration with Eli Roth and “presented” by Quentin Tarantino. It’s a martial arts film, done in the style of the classic “chopsockies” that Rza devoured throughout his formative years. It also culminates a creative odyssey that began nineteen years ago with the release of the Wu-Tang Clan’s classic debut LP Enter The Wu-Tang (36 Chambers). Taking that storied musical legacy into account, The Man with the Iron Fists would appear to have an impossible task on its hands. Despite such insurmountable odds, the film manages to deliver. The first wave of Wu-Tang alums had an unpolished, gritty feel. That was a huge part of their appeal. The same can be said for the genre of films that inspired them. The Man with the Iron Fists carries on in that same tradition, though not solely due to budgetary limitations. Rza shows little aptitude for the nuances of filmmaking. His shot selections, even during mundane moments, feel rather awkward. The same goes for his editing choices. Many key moments lack any connective tissue in the visual sense. The viewer is often forced to fill in the blanks. To be fair, such ineptitude is very much in keeping with the aesthetic of the films Rza is trying to emulate, many of which were notoriously crude. The Man with the Iron Fists is reminiscent of the latter day Shaw Brothers productions, released during the late 70’s and early 80’s. It even echoes the films of Joseph Kuo. Rza hasn’t crafted a homage, but rather an example of something that a more skilled filmmaker would someday pay homage to. Iron Fists doesn’t just emulate classic chopsockies, it actually is one. In the last decade and change, directors like Quentin Tarantino and Robert Rodriguez been at the forefront of an ongoing B-movie revival. Their collaborative double feature, the appropriately titled Grindhouse, is an example of that sentiment at its most indulgent. Iron Fists could have easily played as the third entry of a triple bill along with Planet Terror and Death Proof (The two films that Grindhouse is comprised of). The major difference between Iron Fists and the two halves of Grindhouse is that Tarantino and Rodriguez had a keen sense of self-awareness. By comparison, Rza views the material with unwavering reverence and not a hint of irony. While that could definitely be seen as a crippling flaw, it also exudes a certain charm. It makes the film somewhat endearing, despite its shortcomings. The rather clunky filmmaking proves stifling to the film’s fight scenes. Cinematographer Chi-Ying Chan and editor Joe D'Augustine offer an abridged version of Corey Yuen’s fight choreography. Again, the viewer is left to connect the dots. That sort of thing is nigh unforgivable in a film of this type. On a much more positive note, the weaponry and bloodletting are endlessly inventive. Rza shows a child’s enthusiasm for such things. Rza takes the same approach to filmmaking that he does to music, which is to say that he samples profusely. Early Wu-Tang albums were a collage of influences and ideas from a myriad number of sources. Likewise, Iron Fists culls from a number of Asian B-movie genres. It borrows most heavily from the Shaw Brothers catalog. Savvy viewers will note obvious references to King Boxer, Five Venoms, Crippled Avengers, 36th Chamber of Shaolin, Five Element Ninjas, and Eight Diagram Pole Fighter. Rza also borrows from Japanese Anime classics like Ninja Scroll and Fist of the North Star. There are also nods to the Star Wars saga. In one instance, the infamous Wilhelm scream can be heard on the soundtrack. Spotting these references is like playing a cinematic game of Where’s Waldo? Aside from bad dubbing and non-existent production values, perhaps the most notorious aspect of this genre is the acting. Again, Iron Fists falls right in line with its many inspirations. Cung Le, Byron Mann, Rick Yune, and Daniel Wu often come off like stock players in a late 80’s Shaw Brothers film. As the blacksmith, Rza barely emotes. On the other end of the acting spectrum are Russell Crowe and Lucy Liu. As Jack Knife, Crowe not only chews scenery, but savors the aftertaste. Despite the outlandish settings, he seems right at home. As Madame Blossom, Lucy Liu is the female answer to Han from Enter the Dragon. The Man with the Iron Fists is not, in the traditional sense of the word, a “good” movie. On a technical level, there’s not much to recommend. Yet, by the onset of the third act, I found myself enthralled by its nonsensical story. Throughout its running time, I had most certainly been entertained. How can that be possible if the film isn’t actually any good? The answer is simple. Whatever his flaws as a filmmaker, Rza’s enthusiasm is infectious, and eventually trumps his limitations.
" Throughout its running time, I had most certainly been entertained. How can that be possible if the film isn’t actually any good? The answer is simple. Whatever his flaws as a filmmaker, Rza’s enthusiasm is infectious, and eventually trumps his limitations." Thank you for articulating that critique, I couldn't quite find those words. But they are my sentiments after seeing the film, dead on. Man With The Iron Fists is an homage made in the spirit of fun. The film's best enjoyed with that in mind. Even though I cringed at the editing of the fight sequences it wasn't a deal breaker for me and I ultimately enjoyed the film as well. Good review, my one disagreement is I actually felt Bryon Mann gave a great acting performance as Silver Lion. I thought his charisma shone above the others and that he added an appropriate amount of humor to his part as well.